The hunters reportedly lured Cecil out of Hwange National Park, where it is illegal to kill wildlife, at night. Cecil was shot with a bow and arrow. The wounded lion didn't die until 40 hours later, when the hunters tracked him down and shot him with a rifle. They then skinned and beheaded him. The Zimbabwe Professional Hunters and Guides Association confirmed that Cecil was killed outside the park on private land, and an investigation is ongoing into the legality of the hunt. 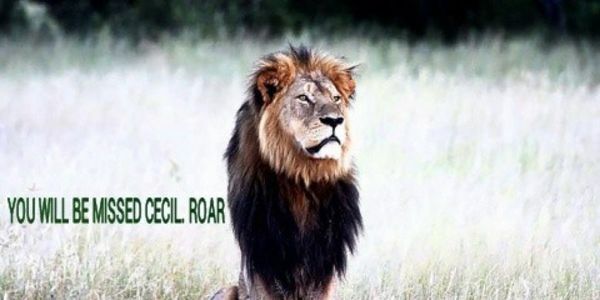 The legend of Cecil started about three and a half years ago, when the then-10-year-old lion was kicked out of his pride, beaten by younger, more powerful males. Hunters argue that as loners, prideless male lions aren't as important to sustaining lion populations. But Cecil wasn't finished. He soon teamed up with another lone male named Jericho, and the lions regained control of the region's two prides, one of which consists of three lionesses and seven cubs under seven months old. The loss of Cecil most likely spells the end of Jericho's reign, and the possible loss of the pride's cubs. Jericho, as a single male, will be unable to defend the two prides and cubs from new males that invade the territory. This is what we most often see happening in these cases. Infanticide is the most likely outcome. Last week, the lion, Cecil, crossed just outside the park&apos;s border, and a bow hunter shot the 13-year-old big cat. The hunters reportedly tracked down the wounded lion two days later, killing him with a rifle. The Zimbabwe Professional Hunters and Guides Association confirmed that Cecil was killed outside the park on private land, meaning the killing wasn&apos;t illegal. The legend of Cecil started about three and a half years ago, when the then-10-year-old lion was kicked out of his pride, beaten by younger, more powerful males. Hunters argue that as loners, prideless male lions aren&apos;t as important to sustaining lion populations. The loss of Cecil most likely spells the end of Jericho&apos;s reign—and the possible loss of the pride&apos;s cubs. "Jericho as a single male will be unable to defend the two prides and cubs from new males that invade the territory," Loveridge said. "This is what we most often see happening in these cases. Infanticide is the most likely outcome." Please demand justice for Cecil the lion, and stop trophy hunting in Africa once and for all! Bad news I'm afraid - charges have been dropped against the hunter who charged Palmer $50,000 to help kill Cecil. It's more important than ever that you share this petition with your friends on Facebook. We will continue to fight for justice. I SENT JACOB ZUMA, PRESIDENT OF SOUTH AFRICA, AN EMAIL TO BAN ALL TROPHY HUNTING IN AFRICA. I MADE THIS PETITION, AFTER THAT VERY SAD DAY CECIL LION WAS KILLED. NOW I REALIZE IT SHOULD HAVE SENT PETITION TO JACOB ZUMA INSTEAD OF MUGABE. HE HAS DONE SO MUCH MORE THAN HIM IN CONSERVATION, I'M PRAYING ZUMA WILL GET MY EMAIL, AND REPLY BACK. WE ARE ALL THE VOICES, AND WILL CONTINUE TO STAND STRONG FOR ALL THESE PRECIOUS ANIMALS THAT DESERVE TO LIVE AND BE HAPPY WITH THEIR FAMILIES. I APPRECIATE ALL SIGNING AND SHARING PETITION FOR CECIL. PLEASE KEEP SHARING. WE CAN END POACHING FOR GOOD. OUR VOICES ARE STRONG AS ONE.